Under Father Noyle's care the Dunedin congregation grew; by the end of 1888 the mem­ bership stood at 41. The congregation took the name of the Good Shepherd from Bishop Weed's fonner parish, the Church of the Good Shepherd in Summerville, now a part of Augusta, Georgia. The church was built on what is now the comer of Edgewater Drive and Albert Street, on land purchased from William H. Simpson. 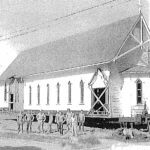 Building began in the summer of 1887. 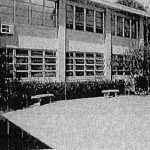 Mr. Osborne was the builder, using lumber cut at Simpson's sawmill in Sutherland, now Palm Harbor. Two ladies, Mrs. William Simpson, wife of the gentleman who deeded the present site of the church, and Mrs. George L. Jones, sister of the Bishop of New Orleans, sparked the drive to build. Construction lagged before "cupid" intervened in the lives of two bachelor Englishmen. One was Father Noyle, who was pining away for his beloved Amy Florence Thompson in England, and the other was the widowed Duke of Sutherland, who wanted to marry his companion Caroline Mitchell Blair. Father Noyle used his skill as a carpenter and cabinet maker to speed the project along. 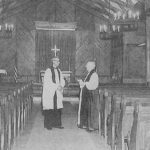 Bishop Weed consecrated the newly finished church building in time for the marriage of both of these gentlemen on March 4, 1889. Promptly at 8:00 a.m. Father Noyle and Miss Amy Florence Thompson became husband and wife with Bishop Weed officiating; and then at precisely 11:00 a.m. the ceremony was performed for the Duke and his bride Mrs. Blair. Father Noyle returned to England in 1892, as did many of the English residents here and throughout central Florida as severe freezes devastated the citrus industry in which they were engaged. This withdrawal of much of the core of our membership, together with economic conditions generally, caused severe retrenchment in the work of the Episcopal Church throughout peninsular Florida. A number of early churches closed permanently. Good Shepherd for many years was served by many different clergy, often on an occasional basis, and generally in connection with other nearby Episcopal congregations. It was often without regular services for a considerable period of time. 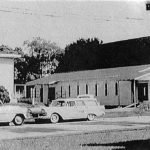 Into the 1940's the small congregations at Safety Harbor, Tarpon Springs, New Port Richey, and Dunedin were served by a single priest or, at times, a seminarian. Our first resident priest, the Rev. Cannon Eric Robinson, arrived in 1947.A temporary wartime barracks building was brought from Safety Harbor to become our first parish house, and a vicarage was created by remodeling another military barracks. The Reverend Charles Folsom-Jones came in 1953 as Good Shepherd's first full-time vicar. Under his fifteen year leadership the congregation attained parish status in the Diocese of South Florida in 1955. That same year the old vicarage and Parish House were moved away and a new Parish House built on the site. The heavy cast iron bell was moved from the original bell tower to the new Parish House. 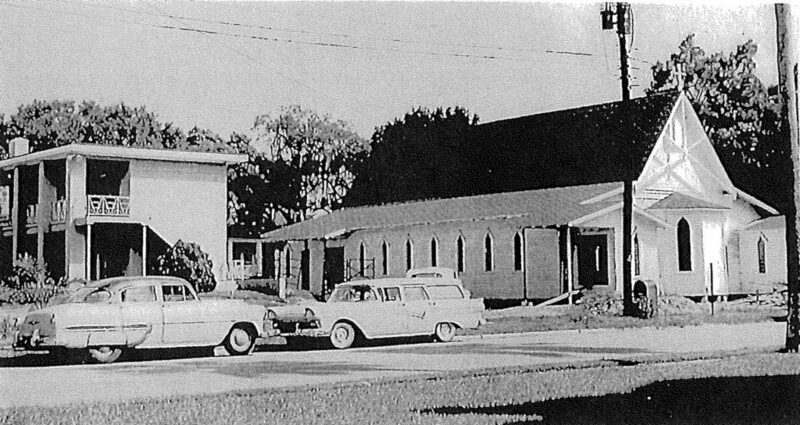 In 1958 land was purchased to provide for future expansion and the church was moved to its present site and further enlarged. Seating capacity was increased from 180 to 300. New entrances and exits were added, new air-conditioning and heating facilities were installed, new arrangements for a choir area were created, and a side altar included for small services and reservation of the Sacrament. The enlargement and remodeling were made possible through the gift of Dr. James H. Cummings, a winter resident. 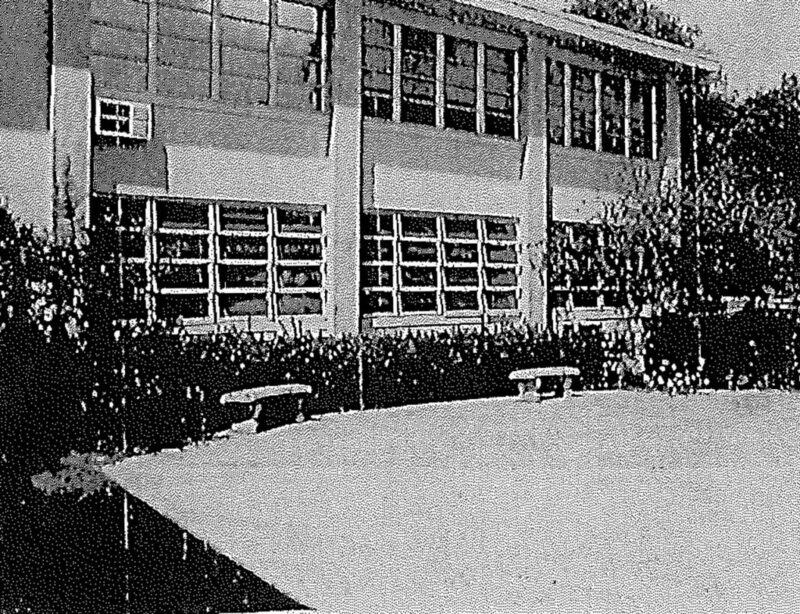 Additional adjoining property was purchased in 1961 and 1963 to provide off-street parking for 74 cars. 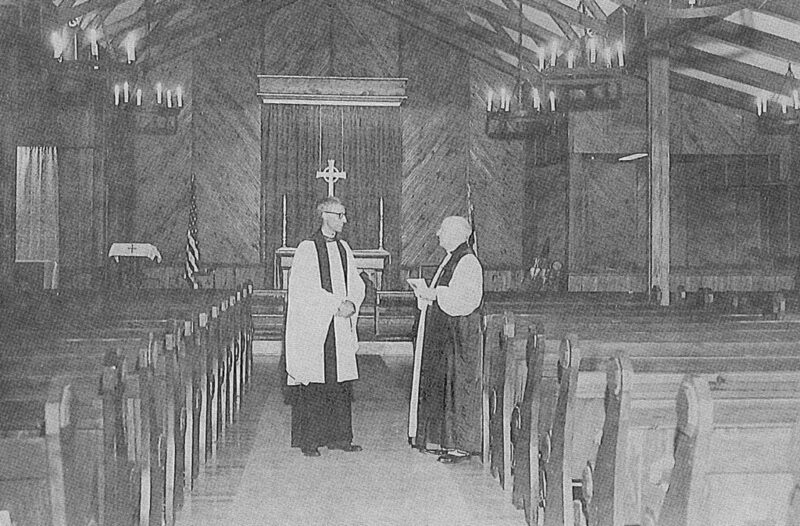 With the coming of the Reverend Terrell T. Kirk as Rector in 1968, the parish turned attention to the consolidation of resources and modernization of facilities in order to meet changing needs. 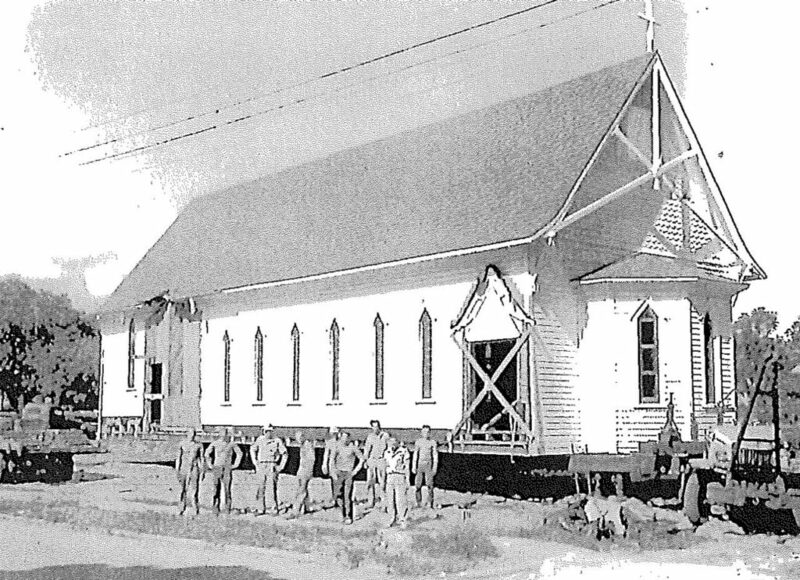 Stewardship education programs led to early retirement of parish debt and provided for purchase of additional property across Albert Street, installation of a pipe organ, and extensive renovation and remodeling of the church and parish house. Father Kirk retired in April 1991, after serving the parish for twenty-three years. The church razed two houses at the northeast comer of Edgewater Dr. and Albert St. The decision was made to convert the property into a recreational area, and also provide auxiliary parking for the parish. Christmas 1982: Chancel area before the pipe organ was installed. In 1981 plans began for a Parish Improvement and Organ Fund which enabled the members to undertake necessary major repairs for the preservation of their beloved and beautiful church, now approaching its centennial. They also completed successfully the extensive remodeling required for the worshiping congregation and accommodation of both the new organ and enlarged musical program. Almost half the exterior woodwork was replaced, the church exterior painted, the sanctuary and choir reconstructed with a new Communion rail, and more effective lighting installed. Roof and floor beams were strengthened, the ceiling restored and given a highly effective acoustical treatment, and one of the church entries rebuilt. Gifts by the Episcopal Church Women provided for carpeting the aisles of the church and installation of transparent protective covering over all the stained glass windows. The organ was built by Wilhelm Zimmer and Sons, Inc., of Charlotte, North Carolina. The organ, Opus 296, reflects the Zimmer company's dedication to the highest standards of quality and craftsmanship, and like all Zimmer organs, it is the result of individual design and specifications to meet the needs of our church. Virtually all the components of the organ were designed and constructed in the Zimmer shop in Pineville, North Carolina, with only the reeds and the bench mechanism imported from Germany. The facade pipes are of electrolytic zinc, polished and lacquered. The case is of oak, stained to compliment the woodwork of the sanctuary, and bears hand-executed scroll work in the design of the tree of life. This is an instrument of classical design, comprising 20 ranks with tracker (mechanical) key action and electric stop action. The dedication of the organ was held on April 24, 1983. In the eighties and nineties the parish family expanded and acquired new properties. Property to the south and a home east of the church became available and was purchased. At the beginning of the 21st Century, the Church of the Good Shepherd is combining the best of the old and the new, the ancient and the future, the traditional and the emerging, as it finds many ways to serve the entire community in the name of Christ. Where people from several generations gather to worship God, cherish each other, and serve the community? Where any and all questions about faith, relationships, the Bible are discussed openly and with respect for everyone? Where people think having fun together is a great reason to belong to a church? Where the hurts and hopes of the surrounding neighborhood are taken seriously and addressed compassionately? To celebrate the love of God at any of our services during the week. To ask the questions you've always wanted to ask, to thinlc about faith in new ways, and grow in the life of the Spirit. To gather with a merry, mixed group of old folks, kids, Boomers, Xers, students, men and women,just to have fun. To team up with us in bringing good news and good things to the last, the least, the lost and the lonely.